A discussion of Indonesia's finest, according to Indonesia's best travel guide, Lonely Planet. The new ninth edition (published January 2010) of "Lonely Planet: Indonesia" recently hit Indonesian bookstores, retailing at e.g. Periplus for Rp378 800. Here is a list, with links to more detail of each destination. For simplicity, they are split into different themes or sections, in order of west to east. Indonesia's tropical climate and mountainous topography gives it a wide range of highlights; unique flora and fauna, along with some amazing landscapes and scenery. Noteworthy as the world's largest volcanic lake and one of the largest inland lakes in Asia, it's surrounded by great views and the very friendly Toba Batak people. Home of the increasingly endangered one-horned rhinoceros, and some of the little remaining rainforest in Java. Indonesia's most visited volcano, if not it's most (in)famous. A frequent stopover on the backpacker trail through Java to Bali. An eco-tourist destination where you can get up close and personal with some of Indonesia's endangered orangutans. A protected rainforest where the preferred way to travel is by boat. Inspiring and similarly noteworthy, a rare combination of three volcanic lakes, each a different colour. Home to the most well-known of Indonesia's many uniques creatures. Sentani isn't just home to Jayapura's airport, but also this lovely and picturesque lake. I know one person with a middle name "Sentani"; his pilot father remembers how much he enjoyed flying over it. The people of Indonesia are certainly multi-cultural; they speak 726 different languages, 247 of them in Papua alone. So whether you're an anthropologist, archaeologist or just interested in learning about different cultures, there is something for everyone in Indonesia. Indonesia's most famous and deservedly World Heritage Listed Buddhist temple, visited by David Beckham in 2007 and soon to be visited by the Obamas. It also is regarded as one of the 1000 Places To See Before You Die. Arguably Central Java's finest religious monument, near Solo. Recently voted Asia's top city as well as one of the 1000 Places To See Before You Die, Ubud is justifiably popular as a place to relax, learn/appreciate Balinese culture and handicrafts, or just a change of pace from the south of Bali. Home to a unique culture where funerals are the biggest party. It also is regarded as one of the 1000 Places To See Before You Die, and the location of arguably Indonesia's most unusual postcard. West Timor, East Nusa Tenggara. 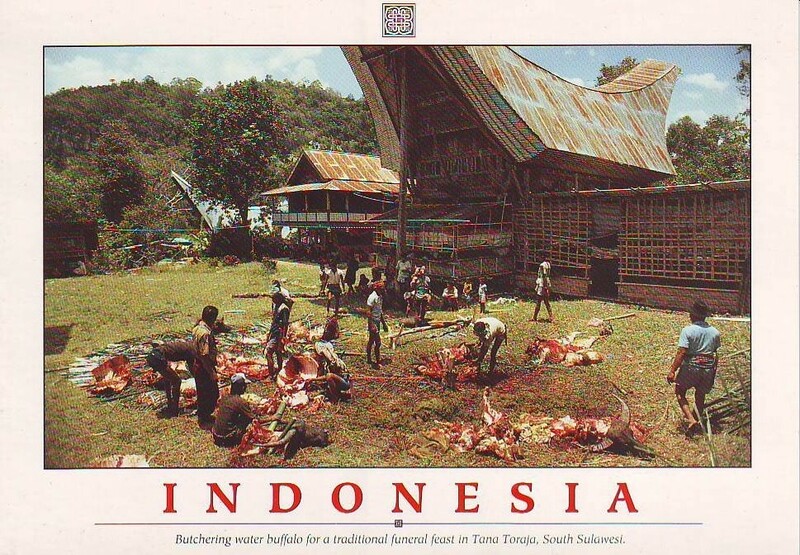 Included in the new edition at the expense of Sumba for its unique culture and bee-hive houses. Undiscovered until 1945, it is surrounded by amazing mountain scenery and lots of great hiking opportunities. It also is regarded as one of the 1000 Places To See Before You Die. Clubbing in Bali and Jakarta. A somewhat more controversial choice IMHO (as it's not really unique to Indonesia)... but if that's your thing, then that's another way you will also enjoy your time in Indonesia. These locations are all fantastic, so arguments over which one is the best are futile. Just visit and enjoy as many as you can! Enjoying a revival in tourist numbers. You can read and see more about it here. Near Pangandaran, this volcanic sand beach is a lovely place to sit back and relax. Apparently, it is also a great place to learn to surf. One of Bali's many surf beaches, this one is for the more experienced surfer. Previously noted for its quiet beaches, the Gili Islands offer a respite from reality for a fraction of the cost of some of its peers next door in Bali. You can now travel there direct from Bali by Perama boat. Read more here. If it's Lonely Planet writer M. Cohen's favourite place in all of Borneo/Kalimantan (including Malaysia and Brunei), then it must be pretty good. Read more in Best deserted beaches. Forms part of the famous Coral Triangle, and recently hosted an international conference on ocean protection. Former Miss Indonesia and current WWF Marine Conservation Ambassador Nadine Chandrawinata is apparently a fan, after learning to scuba dive there in 2006. It has some very nice and quiet beaches, possibly because it can be very difficult to get there in the first place. Apparently, the diving is spectacular too. Home to such lovely sea views, which currently adorn the Rp1000 note. The unique attraction of diving here is the many World War 2 relics that still dot the marine landscape. Some really nice beaches too. Raja Ampat Islands, West Papua. A new addition to the Highlights of Indonesia this edition, deposing diving in Biak. Again, its relative isolation can be good (conservation and not crowded) or bad (difficult to go there), depending on your viewpoint. Do you agree with Lonely Planet's choice of locations? Why/why not? Regardless, please also share your favourite places in Indonesia below. Aku setujuh, benar indah sekali. Tapi kapan mulai bersih-bersih pantai? On beaches, here was a picture apparently from Bali that I posted over here. That list, I’ve only been to three of those places, poorly travelled, I’m not including ‘clubbing’ though which I have unenthusiastically done but not in either Bali or Jakarta. Still, some of the places should make it onto an “Indonesia highlights” list, and some are rather random. Sumba – one of the most deeply traditional, little touristed islands in the country, but very easily accessible for an independent traveller. Your picture Patung pretty much sums up any “tourist” attraction including those listed by the Timdog. Unfortunately it is getting harder and harder to look past the filth when Indonesia’s neighbours have grasped the concept of clean = money. It is one of those weird contradictions that is Indonesia brings rampant unthinking Nationalists mobs popping into existence at a moments notice as they they stand “waste” deep in their own refuse and excrement. No Prambanan Temple on the list? I always thought it was more beautiful than Borobudur. Oigal: Yes, I agree. I am one of those flashpackers that people despise, and I remember once I cancelled a visit to Bromo just because my group couldn’t find a clean hotel. That was probably 15 yrs ago though. I agree with you about Prambanan. It’s also World Heritage-listed, and to my way of thinking is more artistically and intrinsically interesting with its depiction of many different gods. It also has nightly performances of (an edited version of) the Ramayana, with multi-lingual programs to explain what’s going on. I agree very much with the choice of Tanjung Puting. And Bromo, Borobodur and Prambanan should be on any list also. Imagine if Bali would be clean and unspoiled. It would be stampeded by hordes of foreign tourists, prices would skyrocket and what’s left of the sawah would be turned into parking lots. INteresting how some people are blaming Toyota for the tragic loss of life of 3 youths in Menteng earlier this month. Can I suggest if it this sort of attitude that is also encapsulated in the population’s attitude to tourist resources. In short, it must be someone’s fault why the country is so dirty, certainly not mine. An original idea would be to organize in Bali sightseeing trips of unfinished and abandoned building projects. I believe they call them ‘white elephants’ and there are a lot of them. The one in the picture below is in Padangbai, overlooking one of the last pristine and clean beaches in Bali. Bali still gets its fair share of tourists despite its lack of cleanliness. I’m not sure too many people from Boganville NSW have decided going against there for their Bintang holiday for that reason. I heard Prambanan got damaged in the earthquake a couple of years ago. How’s it looking now? Indonesia’s brilliant. It’s only been two month since I was there, but I want to go back. On another note, check http://www.booko.com.au for the cheapest prices for the book in question. The Book Despository will post to different countries for free, so you can get it much more cheaply through them than in a bookshop in Melbourne or Jakarta. The Padangbai project was halted because of a lack of permits. Still a blight on the cliff. ( kiriman Ujung Pandang) or beautiful Bunaken ( kiriman Manado). Sods. It is now! I complained and they added it in on a “trial basis”, so we’ll see how it goes!! Last time I went there – already some 5 years ago – it was still clean. But then access was much more restricted and only the brave and the fit managed the climb. Here is a picture of this beach in Padangbai 5 years ago. As you can see, still clean as a whistle. Looks lovely in that picture. I’ve never had the pleasure. Glad to hear you had some success with Book Depository, Patung! I always end up buying from them. Why are so many companies reluctant to ship to Indonesia? Unreliability of the Indonesian postal system? I got two replies from Book Depository, first one said their shipping agent could not send to Indonesia, second reply a few days later from a different person, I think the boss, said they would now add Indonesia on a trial basis. I got my first order from them a few days ago, took three weeks from time of ordering, I think two of those weeks were shipping time, the first week ‘processing’. They’re often a couple of dollars more expensive than Amazon, but minus the $10 amazon shipping fee per book. I’m a Dayak photographer, by my handwritten, i would like to invite every one to visit West Borneo now and you could see thousand unique of the Indigenous life otherwise you’ll lost them forever because the uptown invasion especially from the Java islands, the invasion will wipe some most valuable the indigenous traditions and their life and would heard the story only. the long ear of Indigenous of West Borneo will disappear next several year, Visit it or lost it ! Comment on “Lonely Planet’s Indonesia Highlights”.